The WEBSHOP is NOW OPEN! Question: How can you possibly improve the perfection? Answer: You just make it even more perfect! OD808 Overdrive - Tubes are Screaming! The BEST ever made overdrive pedal. One of the MOST FAMOUS guitar effects in the history of the modern music! Although MAXON did not design the original TUBESCREAMER© by Ibanez©, the company was contracted to make them! 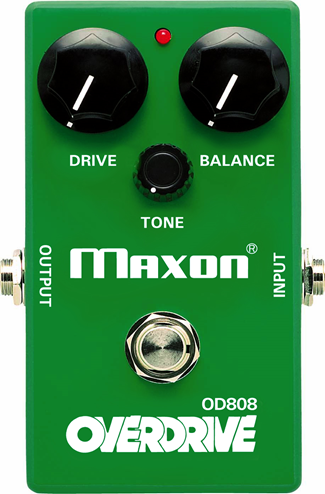 And then MAXON decided to sell the pedal under its own very reputable name in the guitar effects manufacturing. An excellent tone and reliability in one package. This is the latest - NEW AND IMPROVED model. Please, note the new graphics on the pedal - now the "IN" and "OUT" are clearly marked on the top of the pedal, whilst the old one had markings on the sides, which was not very practical. The main improvement is that the pedal now has a separate battery compartment which makes it easier to change the 9V battery. Also, the pedal now comes with 2 self-adhesive rubber pads so you won't scratch it and it will fit perfectly onto your pedalboard. - to fast for a few months saving for the hugely overpriced original pedals, as all of them had been discontinued decades ago; then to buy one and take risks associated with the inconsistency of components in the old days and dubious “upgrades and modifications”. Don’t forget the rust and, pun not intended, metal fatigue! - to fast for a few months again and then to buy a “boutique” FUZZ pedal. These pedals are available from many sources and some of them sound quite good, however there are also some risks associated with the inconsistency of components due to the limited buying power and lack of the industrial quality control. - to seat, eat properly and wait till one of the industrial manufacturers has made one pedal combining the best of both worlds: the passion for sound and the spacecraft quality control. The wait is over! 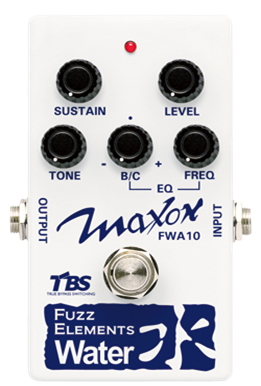 The MAXON FW10 Wind FUZZ pedal is a Wind of Change in the FUZZ guitar making. Try one! You will be greatly rewarded with the superior tone! FW10 Fuzz Elements Wind - Happiness Is The Vintage Fuzz! FWA10 Fuzz Elements Water - The Dark Side Of The Fuzz! This the best ever replica of the original BIG MUFF©. Think Dave Gilmour and many other great guitar players who played the original pedals back in '70s! The Wall of Sound and the sound of The Wall©! 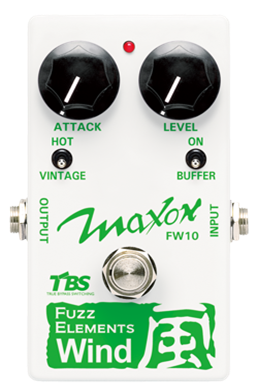 As per nowadays, there are many types of this FUZZ/Distortion pedal on the market – there are many tonal variations, as well as qualities. This is the outstanding Japanese reincarnation of the classic tone. Not only the design, the components and the execution are perfect, but the pedal is the most versatile modern Fuzz ever - the added parametric tone section offers a wide array of new and unheard tones! Please, send us your inquiry e-mail. For NZ and Oceania please e-mail.